RE community | Kokusai Kogyo Co., Ltd. Capitalizing on our experience in helping build communities, we are actively supporting efforts to build a low-carbon society that utilizes renewable energy (RE). With the goal of introducing RE such as solar, wind, and micro-hydro power, Kokusai Kogyo Group offers a full range of consultancy services, including surveys utilizing spatial information technologies, design, and proposals on how best to utilize the generated power. We also offer consultancy services related to energy conservation with the goal of building a low-carbon society. By utilizing our rich expertise derived from spatial information technologies and our experience in building local communities, Kokusai Kogyo Group propose RE-based communities that merge a low-carbon society with regional renewal and revitalization. With the goal of introducing renewable energy such as solar, wind, and micro-hydro power, we offer complete project consultancy services that include surveys of power generation potential that utilize spatial information technology, facility design, methods of utilizing the generated power (Renewable Energy Certificates, etc. ), benefiting from subsidy systems, and business plan development. 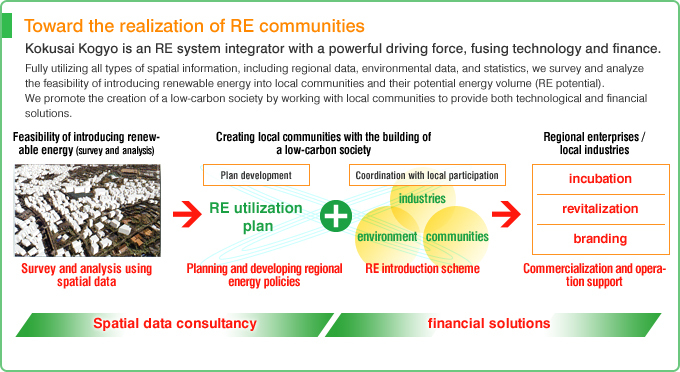 Along with consultancy services for introducing RE, we also help local municipalities reach consensus decisions related to their medium/long-term plans. We also work with local municipalities that are having difficulties introducing RE to help them achieve this through cooperative arrangements. We provide planning and consulting services for creating living spaces that are gentle on the environment, through such measures as introducing energy-saving LED lights, next-generation automobiles, and motorized bicycle sharing. In addition, we provide consultancy services and support, including the creation of monitoring and improvement plans, toward the reduction of greenhouse gas emissions, which is required by the Law Concerning the Promotion of the Measures to Cope with Global Warming and the revision of the Law Concerning the Rational Use of Energy. We also help our clients codify their responsibility to reduce greenhouse gases emitted during development activities. To support the introduction of renewable energy such as solar, wind, and micro-hydro power, Kokusai Kogyo Group offers a full range of consultancy services, including surveys utilizing spatial information technologies, design, and proposals on how best to utilize the generated power. We also offer consultancy services related to energy conservation with the goal of building a low-carbon society. With the goal of introducing RE such as solar, wind, and micro-hydro power, Kokusai Kogyo Group offers a full range of consultancy services, including surveys utilizing spatial information technologies, design, and proposals on how best to utilize the generated power. We also offer consultancy services related to energy conservation with the goal of building a low-carbon society. 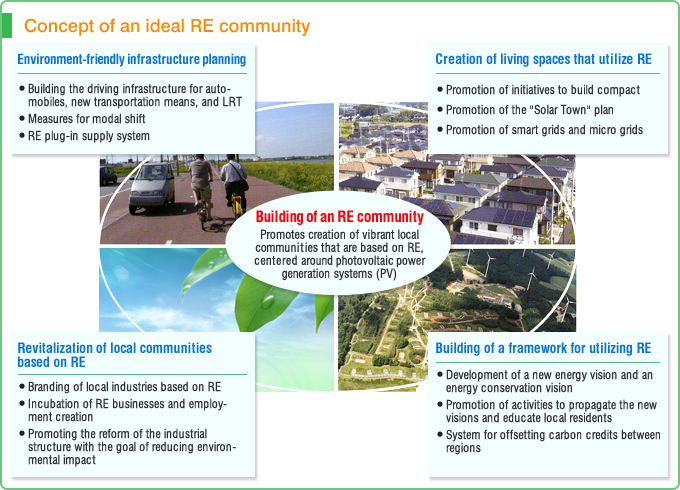 By utilizing our rich expertise derived from spatial information technologies and our experience in building local communities, Kokusai Kogyo Group proposes RE-based communities that merge a low-carbon society with regional renewal and revitalization. A Green Power Certificate certifies the added environmental value of electricity generated by renewable energy, and can be traded in the market. For details, please feel free to contact us. Copyright © Kokusai Kogyo Co., Ltd. All Rights Reserved.